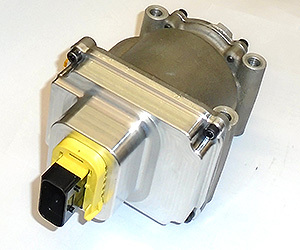 Concentric AB has recently received an order from a global OEM of heavy trucks and buses to produce electric oil pumps for their hybrid applications. Production will start in the second half of 2018, and is expected to generate total revenues of approximately MSEK 38 across Europe ramping up over an 8 year period, reaching a mature volume of 8,000 p.a. in 2026. This exciting new product reinforces the company’s reputation for reducing fuel consumption, increasing system efficiency, providing high power density and reducing noise. Concentric's electric oil pump offers system power savings through its variable pressure and speed control capability with the additional benefits of low noise. It also offers on-demand flow and variable speed capability. The new electric oil pump product allows CAN Bus communication between the motor and the vehicle's main control system so as to control pressure and flow on demand. This significantly reduces system losses compared to traditional mechanical drive systems, ensuring optimum performance. David Woolley, President and CEO of Concentric AB, commented: "This first major nomination for Concentric’s new electric oil pump technology is another significant breakthrough in a market driven by increased electrification and control. Our modular design strategy is ideally suited for a wide range of applications for emerging hybrid electric vehicles and demonstrates our ongoing commitment to innovation that enables our customers to achieve sustainable solutions." Concentric AB har nyligen fått en order av en global tillverkare av lastbilar och bussar, för att producera elektriska oljepumpar för deras hybrida applikationer. Produktion kommer att påbörjas under hösten 2018 och förväntas generera en total omsättning om cirka 38 miljoner kronor i Europa. Produktionsvolymen kommer successivt att öka under åtta år för att slutligen nå en årlig produktionsvolym på 8000 enheter år 2026. Denna nya produkt stärker Concentrics position som en ledande leverantör av produkter som minskar bränsleförbrukning, ökar effektivitet av system, vilket ger en högre effekt samtidigt som bullernivån minskar. Concentrics elektriska oljepump sparar energi genom sitt varierande flöde och hastighetsreglering samtidigt som den har låg bullernivå. Den nya elektriska pumpen erbjuder CAN Bus kommunikation mellan motorn och fordonets styrsystem för att ge tryck och flöde efter behov. Detta ökar effektiviteten jämfört med traditionella mekaniska drivsystem, och garanterar optimalt resultat. Concentric's modular design strategy ideally suited for a wide range of applications for emerging hybrid electric vehicles.